Most of the avionics equipment discussed is only repairable by the manufacturer or certified repair stations that are licensed to perform specific work. The airframe technician; however, must competently remove, install, inspect, maintain, and troubleshoot these ever increasingly complicated electronic devices and systems. It is imperative to follow all equipment and airframe manufacturers’ instruction when dealing with an aircraft’s avionics. The revolution to GPS navigation and the pace of modern electronic development results in many aircraft owner operators upgrading flight decks with new avionics. The aircraft technician must only perform airworthy installations. The avionics equipment to be installed must be a TSO’d device that is approved for installation in the aircraft in question. The addition of a new piece of avionics equipment and/or its antenna is a minor alteration if previously approved by the airframe manufacturer. A licensed airframe technician is qualified to perform the installation and return the aircraft to service. The addition of new avionics not on the aircraft’s approved equipment list is considered a major alteration and requires a Major Repair & Alteration Form to be enacted. A technician with an inspection authorization is required to complete a Major Repair & Alteration Form. Most new avionics installations are approved and performed under an STC. The equipment manufacturer supplies a list of aircraft on which the equipment has been approved for installation. The STC includes thorough installation and maintenance instructions which the technician must follow. Regardless, if not on the aircraft’s original equipment list, the STC installation is considered a major alteration and a Major Repair & Alteration Form must be filed. The STC is referenced as the required approved data. Occasionally, an owner/operator or technician wishes to install an electronic device in an aircraft that has no STC for the model aircraft in question. A field approval and a Major Repair & Alteration Form must be filed on which it must be shown that the installation will be performed in accordance with approved data. There are many factors which the technician must consider prior to altering an aircraft by the addition of avionics equipment. These factors include the space available, the size and weight of the equipment, and previously accomplished alterations. The power consumption of the added equipment must be considered to calculate and determine the maximum continuous electrical load on the aircraft’s electrical system. Each installation should also be planned to allow easy access for inspection, maintenance, and exchange of units. The installation of avionics equipment is partially mechanical, involving sheet metal work to mount units, racks, antennas, and controls. Routing of the interconnecting wires, cables, antenna leads, etc. is also an important part of the installation process. When selecting a location for the equipment, use the area(s) designated by the airframe manufacturer or the STC. If such information is not available, select a location for installation that will carry the loads imposed by the weight of the equipment, and which is capable of withstanding the additional inertia forces. Avionics radio equipment must be securely mounted to the aircraft. 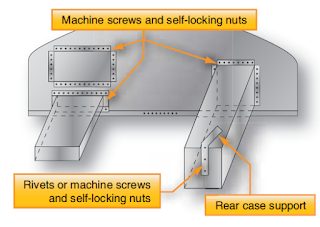 All mounting bolts must be secured by locking devices to prevent loosening from vibration. Adequate clearance between all units and adjacent structure must be provided to prevent mechanical damage to electric wiring or to the avionic equipment from vibration, chafing, or landing shock. Do not locate avionics equipment and wiring near units containing combustible fluids. When separation is impractical, install baffles or shrouds to prevent contact of the combustible fluids with any electronic equipment in the event of plumbing failure. The performance and service life of most avionics equipment is seriously limited by excessive ambient temperatures. High performance aircraft with avionics equipment racks typically route air-conditioned air over the avionics to keep them cool. It is also common for non-air conditioned aircraft to use a blower or scooped ram air to cool avionics installations When adding a unit to an aircraft, the installation should be planned so that it can dissipate heat readily. In some installations, it may be necessary to produce airflow over the new equipment either with a blower or through the use of routed ram air. Be sure that proper baffling is used to prevent water from reaching any electronics when ducting outside air. The presence of water in avionics equipment areas promotes rapid deterioration of the exposed components and could lead to failure. Vibration is a continued motion by an oscillating force. The amplitude and frequency of vibration of the aircraft structure will vary considerably with the type of aircraft. Avionics equipment is sensitive to mechanical shock and vibration and is normally shock mounted to provide some protection against in-flight vibration and landing shock. Special shock mounted racks are often used to isolate avionics equipment from vibrating structure. [Figure 2] Such mounts should provide adequate isolation over the entire range of expected vibration frequencies. When installing shock mounts, assure that the equipment weight does not exceed the weight-carrying capabilities of the mounts. 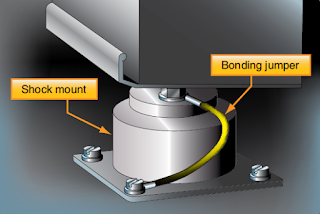 Radio equipment installed on shock mounts must have sufficient clearance from surrounding equipment and structure to allow for normal swaying of the equipment. Radios installed in instrument panels do not ordinarily require vibration protection since the panel itself is usually shock mounted. However, make certain that the added weight of any added equipment can be safely carried by the existing mounts. In some cases, it may be necessary to install larger capacity mounts or to increase the number of mounting points. Overall rigidity of the mount. If the mount is too stiff, it may not provide adequate protection against the shock of landing. If the shock mount is not stiff enough, it may allow prolonged vibration following an initial shock. 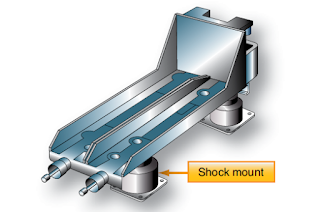 Shock-absorbing materials commonly used in shock mounts are usually electrical insulators. For this reason, each electronic unit mounted with shock mounts must be electrically bonded to a structural member of the aircraft to provide a current path to ground. This is accomplished by secure attachment of a tinned copper wire braid from the component, across the mount, to the aircraft structure as shown in Figure 3. Occasional bonding is accomplished with solid aluminum or copper material where a short flexible strap is not possible.